My pockets were starting to get rather heavy with various bits and bobs, or I would be wasting time looking for things, or trying to access them through several layers of garments. I wanted to extend the concept of having a place for everything and everything in its place to things I need regularly, and should be carrying about on my person. Having things dangling off my neck was not a comfortable idea, nor was stuffing my rear pockets even further or having too many things swinging from a belt. I then hit on the idea of the body bag, which distributes everything over a large area. This organiser bag is worn as the most outer garment, which means that all pocket content is readily accessible at all times. 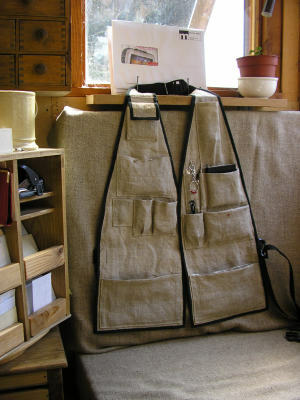 To allow wearing over various number and thicknesses of layers, the bag is adjustable by having a strap going around the back of the neck with a buckle, and the two panels are held in place at the front with a belt, which can either be worn around the front, or looped through the side loops and fastened behind the back. The panels have only pockets for things I would like to have accessible at all times, and items which are only needed in certain areas or situations are carried in add-on pouches or attached to the belt with loops. I just finished the main panels and one general purpose tool pouch	which I wear whenever I step outside the house for any length of time. town - for purse, driver's licence etc. The body-bag had its first outing today and served its purpose well. I had an idea about where to park it and make use of it at the same time (I don't like to wear it if I don't have to), and naturally wrote it straight onto a blank to-do slip. The result is the first picture below. Then it occurred to me that I may forget that I have active slips in the pocket, so I came up with a flagging idea (second picture below). I stitched a hook above the blank to-do slip pocket and one inside the lower empty pocket. Then I wrapped some highly visible red thread around a key ring and extended it with a little chain and another smaller split ring. The flag is parked in the lower pocket, but is transferred to the upper one when I write something down on a slip. Also, I did not have to fumble with the combination lock on my letter box today, as my glasses were at hand, and the pocket for the mail left me with free hands to pick up some firewood on the way back. Two nails later the body-bag is parked up, and a mail inbox is created at the same time. Another outing, another idea: a small bell as an audible flag to check the 'take list' when setting off. The flag would be hooked to the outside when I write a list, but am not ready yet to go out. As soon as I put on the body-bag, I will hear the bell and check what needs to be taken.